How often do you get a guilty conscious when someone says statements like “We all can save the Earth!” or “How can you help to save our planet!”? Do you wonder “How can I possibly save the Earth alone?” or “How can I make a change?”? I can so relate to those thoughts and feelings. I used to feel that way too. It’s not easy to carry that burden around. It’s a heavy one trust me. It’s like you are being blamed for actually living on this planet and making a mess of it. You feel like the finger is being pointed at you and your lifestyle and then you think there is no way you can single handedly go on a crusade to make the required changes. “There are others who have more power and can do it more effectively!” With that you push that guilt out of the way and think others will take care of it for you. When I was 25/26 years old I too left all that to the more influential people in our society. Thinking if they took care of it and I agreed with what they were doing our Earth would be saved. Unfortunately it does not work that way. As I grew older I heard the warning signals and saw the signs our Planet Earth was sending out to us. Tsunamis, hurricanes, floods and many other horrendous indications was what I watched helplessly. Each time that nagging conscious of mine eating up a bit more of me inside. Well I guess with age comes wisdom and I took control of my own space. I might not be able to save the planet alone but I can certainly clean up the area around me - my home and my way of thinking. I can become a part of those who have also decided to take action and reduce the impact. As I dug deeper I realized that in actual fact it was a lot easier than I had imagined – the best part was – I was actually contributing to saving the Earth. What a buzz! What did I learn and what am I doing to save the earth? It’s so easy and I am sure once you see the actions, you too will easily want to join in. Most of us are probably already doing one or the other thing, maybe even unconsciously. We use energy saving light bulbs at home. They use up to 50% - 60% less energy reducing approx. 300 pounds of CO2 per year. When we moved to Weimar I tried to make sure all the new appliances we bought were marked the Energy star label. I still have one thorn in my eye – my refrigerator. But I am hoping that after it’s 7 year lifespan it will soon give up and allow me to buy a new earth friendly model. I do not have a dryer! I hang all my clothes on a washing line. In the summer my clothesline moves to our balcony and in the winter it’s upstairs in our attic. I read somewhere that in 6 months I can save up to 700 pounds of CO2! In Germany recycling is a part of everyday life. With the Gruener Punkt system we recycle the packaging or wrappings of several products carrying the green point symbol in special bags or containers. Glass bottles and containers are separated and thrown in special containers, magazines, newspapers and other paper items are sorted into paper the appropriate containers. Most of our printing is done on recycled paper and our toilet paper is also made of recycled paper. We turn off devices and appliances we do not use. Like DVDs or our notebooks. We have multi-plugs with switches on them wherever there are several appliances or devices in one area – like our office or the living room. All we do when we are not using these is switch the one switch off to take it off the power. Incredibly just this one action allows us to save thousands of pounds of CO2 every year. One thing I am planning on doing in the future is to buy myself a new car. My current VW Golf has been a very faithful partner for the last 9 years. No breakdowns, is in great shape and runs smoothly. Although being a small car it is economical and saves a huge amount of CO2, I still can do better by investing in a car with a hybrid motor. As we are planning on leaving Germany within the next couple of years, I have already picked out the car I will be driving in the future. If it becomes available in the model I would like it. Otherwise I will choose one from the growing list of hybrid cars. When it comes to food stuff I try to buy most of my fresh produce from the local Farmers Markets or at least those that are made/produced in Germany (or Europe). It’s really quite easy as you can see. True, the first step to make the few changes did sometimes get in the way, but soon it simply became a part of our lifestyle and we do not even think about many of these things anymore – we just do them – without a guilty conscious. For this session of the Monthly Mingle I had called out on everyone to share their version of Earth Food. Simply for one purpose – to show how easy it is to take actions to clean up your own space. My own dish is something I consider earthy because it uses a mix of fresh, organic, store-bought, German mushrooms and mushrooms I picked myself with Soeren in the forest. It was a pure and brilliant experience – waking up in the early morning just a bit before dawn and making our way to the forest to be the first to pick our own mushrooms. 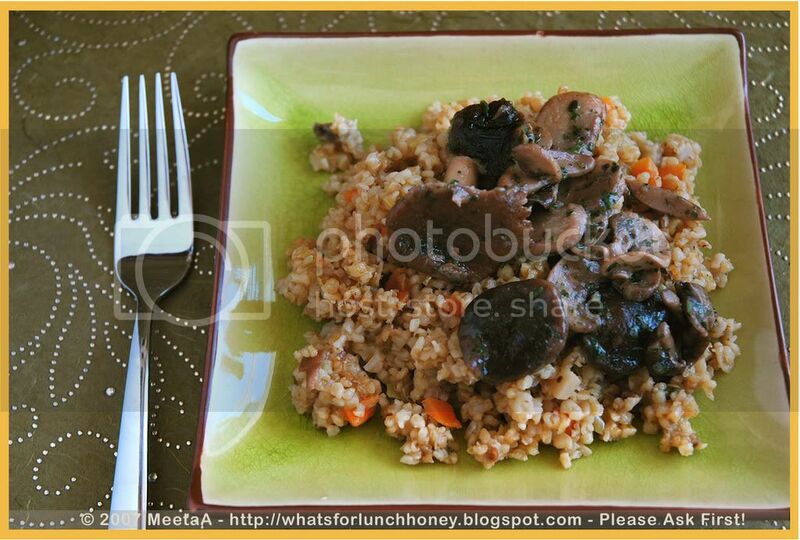 I also used organic Bulgur, which is quickly cooked and allows the aromas of the mushroom to unfold brilliantly. In a large pot add a good dash of olive oil. Sauté the onions and then add the parsnip and carrot to the pot. Continue to sauté until the vegetables have slightly softened. Add the leeks and the bulgur. Mix and allow to cook for 3 minutes. Pour in the stock and allow to simmer for 15 minutes or according to the time stated on the packet. Salt and pepper to taste. In the meantime prepare the mushrooms by heating some olive oil in a large pan. Add the sliced mushrooms and cook till softened. Sprinkle with the herbs, mix well and salt and pepper to taste. 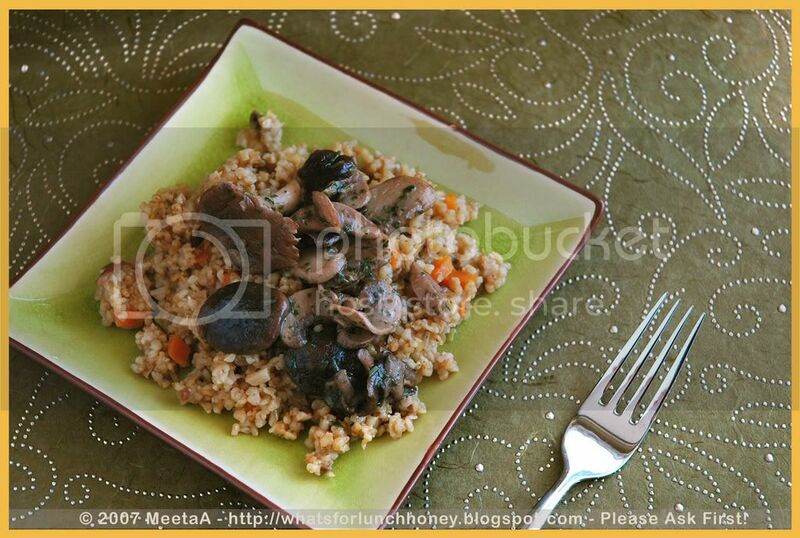 Serve bulgur on warmed plates with a nice helping of the mushrooms on top. Enjoy with a light white wine. Sit back and enjoy the world around you with the taste of this simple but very flavourful dish. To me this earthly dish personifies my efforts to help keep the Earth a beautiful place to live in. This dish tastes of the earthy mushrooms seasoned with the herby flavours of home-grown herbs. 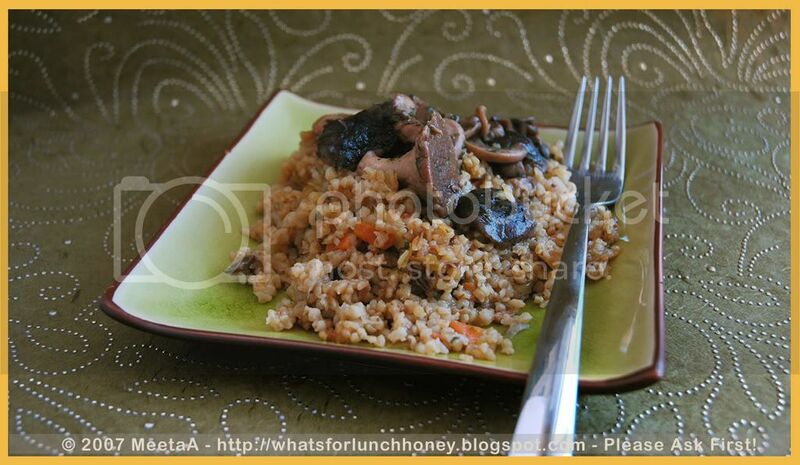 It harmonises with the delicate bouquet of vegetables and wheaty bulgur perfectly. You'll also find an interesting read by my dearest friend Nandita - how to reduce your carbon footprint. Meeta, a beautiful, thoughtful and inspiring post. I was pleased to see that I'm already doing many of the things on your list of steps to take to save the Earth. And I love recipes like this one...very earthy, indeed! A very thought provoking and nice write up Meeta! The dish looks very nutritious and healthy !! what a great way to use mushrooms!!! Lovely, Meeta, and it looks good. We are doing quite a bit..In fact I am in the process of starting a new blog (yeah, like I need another) about green restoration. One of hte primary things that we did is to purchase an OLD house (not old for Europe, old for here..100yrs) that was in need of restoration. Even with the repairs we are not using nearly as much as we swould in building a new home. As an added benefit the old houses are made for cross venelation and even here in Texas we are able to be comfortable with ceiling fans all summer rather than air conditioning..even when it gets of 100 degrees. We are utilizing 0 voc paints, using recycled materials and used items. We have 2 acres and raise dairy goats and chickens, as well as a garden most years. We are moving toward being off grid..but not yet. Great post Meeta! People make fun at how green we are in our house but could still do more. I've given you a couple of well deserved awards. The gongs are on my blog. We are mistaken when we think one person's effort cannot bring change. Change, frequently, is brought about by precisely such people! And your points only show how we all can adopt a sustainable approach to everyday things - if we care for this Earth! 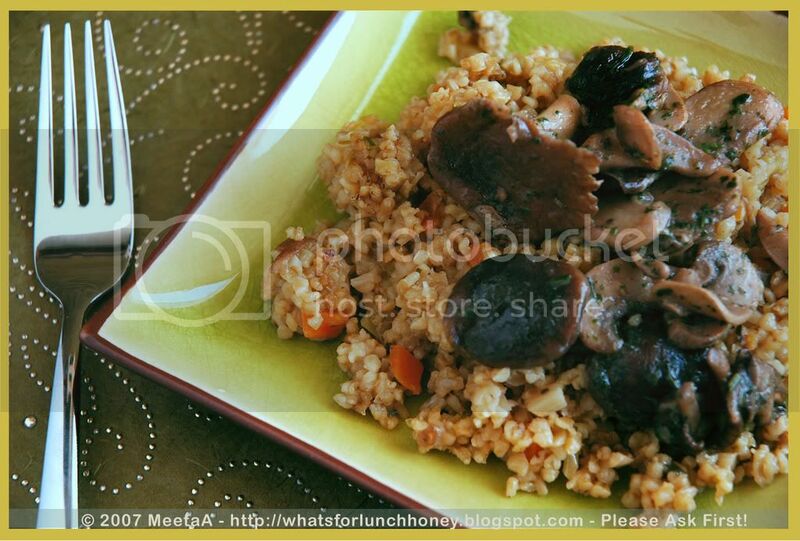 The mushroom-bulgur dish is definitely earthy! Oh that is one healthy dish. 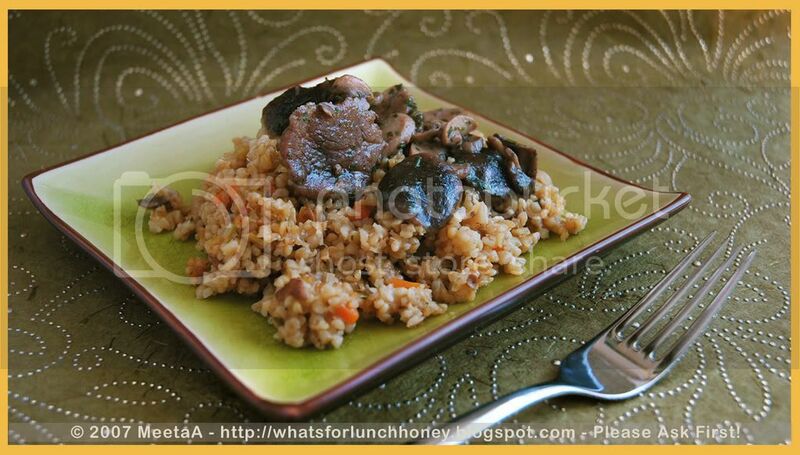 Send me some right now, I love bulgur like anything. I make vegetable khichdi, upma, and burger with bulgur. It is nutritious and healthy. Great post and recipe. Wouldn't it be great if everyone had an environmental conscious behavior in their everyday life? Thanks for the inspiring idea and looking forward to the roundup. this is an incredible post - quite thought-provoking. also, as a vegan, I appreciate this recipe a lot - I LOVE bulgur with mushrooms, and your dish, incorporating these ingredients, is absolutely lovely! I love your list of the things you and your family have done - as you say, it's all easy stuff to do and needn't feel like to much of a hardship. What we eat has an impact on our earth, going vegan is a great way to protect and preserve our wonderful earth. Wonderful post, Meeta. You made me feel good, because I do many of the things you write about, and you made me think about those things I could be doing. Thanks! And thanks for the recipe, too. It looks fabulous, of course! (Will you write a post someday about your photography? I hope!) There's something about mushrooms... I've got a post I'm writing now with morels. Lydia, it's true many of us already are doing these things unconsciously. But when we become conscious of them we tend to go a few steps further and make more valuable changes. Kalyn, I know what you mean - it's like many other ingredients. As a child you kind of go "eeuuww" but when you get older you think you have discovered a whole new taste. Bee, I thought you would like it. Priya, we woow! I have a fan LOL! Thanks for the wonderful comment. Marye, lovely thoughts and what you are doing is really wonderful. Amanda, unfortunately these are the ones that are a bit ignorant to what is really happening. It makes me a bit mad when I come across such people. Thank you for the awards. I am truly honored. Anita, so right. Everyone should just do their part and things will help themselves. But we all need to take the first step. Pintoo, come on over and you can have a huge bowl! Marta, it really would be. The roundup is going to be smashing!! Veggie Girl, There is really something soul comforting about this dish. Hope you enjoy it. Sophie, your own post was lovely too. I do hope you'll come back and let me know about how you liked the dish. Nicole, thanks for tagging me. I'll do my best to post it. Sig, LOL! You and me girl we are two girls that know our cars and know what we want. Kumudha, interesting point and I am sure it plays a big part. Padma, thank you and hope you enjoy it. Toni, thank you for your feedback. Yes, mushrooms are mysterious and taste so wonderful. A lovely dish for your event Meeta. I think like you I must be aware of the power people with the big decisions but I also can play a large part with the small things in my life. It really is all about the choices we make everyday. Re recycling... I moved to HOlland when I turned 18, and was blown away by the emphasis on recycling there. I experienced a shock when I returned to the states 3 years later- nobody recycled anything! Props to your earthy-groovy dish. I left a message here 4-5 times and just had such a bad connection that nothing went right. Lovely post. I made something very similar with dalia a little while ago. Also, how do you know which ones to pick while picking wild mushrooms? I know that's a stupid question, but I'd love to hear.